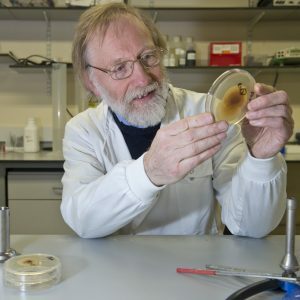 Allan is now an Emeritus Fellow of the John Innes Centre, and although he no longer runs a research group, he retains an active interest in understanding the signalling that can occur when plants are infected by micro-organisms. He interacts with Myriam Charpentier who is working on rhizobial legume signalling, with Anne Edwards and James Brown who work on ash dieback disease and with Saskia Hogenhout who works on transmission of plant pathogens by insects. For years Allan analysed the molecular signalling that occurs during establishment of rhizobial-legume symbioses and more recently became involved in understanding the pathogenic interaction that occurs when ash trees are infected by the ash dieback fungus. His work on rhizobial-legume interactions focussed on two main areas, rhizobial attachment to roots and the subsequent signalling events that promote the initiation of plant-made infection structures that enable rhizobia to infect roots, leading to the development of nitrogen-fixing nodules. Allan coordinated a research network called NORNEX that aimed to understand how and why ash dieback disease had spread rapidly across Europe into the UK. This disease is caused by the fungus Hymenoscyphus pseudoalbidus (previously called Chalara fraxinea). NORNEX brought together eleven partner research institutions aiming to understand the basis for pathogenicity in the fungus and analysing the potential of genetically determined inheritance of resistance in ash trees. The ash dieback invasion of Europe was founded by two genetically divergent individuals. Morphotype of bacteroids in different legumes correlates with the number and type of symbiotic NCR peptides.